We invite you to cycle and discover the Lake and Volcano District of Chile with us. Explore this fascinating part of the country dominated by astonishing National Parks, clear-water Lakes, amazing live Volcanoes and one of the best thermal waters in the world. Amazing live Volcanoes and one of the best thermal waters in the world. Our staff will meet you at Temuco airport and transfer you to Malalcahuello, where a soothing thermal bath awaits us at our hotel. Your guides will assist you to assemble/fit your bike and then enjoy a warm up ride. In the evening, we’ll have an orientation and briefing session before our welcome dinner together. Today and followed by a filling breakfast, the minibuses will take us to the Sierra Nevada Range (18 km right through the tunnel Las Raíces, the longest tunnel in Chile (4,5 km ). Here we’ll set off on our first ride, traveling alongside the Lonquimay River by an almost flat valley; this 54-km section features one of the smoothest roads. We’ll bike through the lands of different Pewenches communities, ascending the international path Pino Achado until reaching the Customs. The road is quite rolling with flat sections and a few small climbs and good down hills. If you want to pedal up some serious grades, it is possible to extend the route on 22 km more, until the peak altitude of 1.884 meters (6.181 feet above sea level); on the top you can enjoy breathtaking scenery of the Andes. In the small village of Liucura, we’ll arrive at the meeting point with the minibuses that will take us back to Hotel. After breakfast, we’ll start our morning with an amazing downhill from our Lodge towards the valley from the village of Malalcahuello – We’ll ride alongside the Cautín River as the valley opens after each meter we descent the foothills of the mountain range until arriving at the plain of Curacautín. As we leave this town we start climbing a good hill with a beautiful view to the volcanoes Llaima, Lonquimay and Tolhuaca. Then there is a fun descent until you get to an extensive green valley. This section of the route passes through the middle of seeded fields on smooth hills until we arrive to the city of Lautaro where we end the ride. In Lautaro we get in the vans and start traveling to Pucón (2 hour drive), the main adventure tourism destination in the Lake and Volcano District. We’ll cycle from our hotel to the village of Caburgua where we’ll enjoy a beautiful view of the beach of Lake Caburgua and top of Llaima Volcano. The road today is a constant false- flat with a few short climbs – just enough to get your legs going. Before you start cycling, the staff will provide a snack for you to bring with you and some more on the support van. Throughout today’s ride our guide will help us identify several species of birds and trees as we cycle next to beautiful farms and enjoy views of the Villarrica volcano. With a little good luck, we will see smoke coming out of the active Villarrica volcano. After cycling the rolling road to Huife, we will visit the Hot Spring Resort and enjoy a soothing soak in a hot mineral bath, having lunch at the hot springs. Later we’ll take a short ride in the vans back to our hotel in Pucón, or you can ride in your bike if you want. At 20:00 hrs we’ll pick you up at the Hotel and take you to a local organic restaurant in Pucon. We’ll cycle from outside of Pucón to our first stop at Curarrehue town. The first 33 kms are relatively flat and next to the beautiful Trancura River, with amazing views of 3 Volcanoes: Villarrica, Quetrupillan and Lanin. Our last 30 kms section will be ascending to the border in Argentina by a brand new asphalt and admiring look out points with beautiful small Lakes, waterfalls and getting to the foots of Lanin Volcano, one of the tallest of this area and that is shared by Chile and Argentina. Once the ride ends, we’ll be able to enjoy a nice lunch at a local restaurant and then drive back to your Hotel in Pucon. Each day brings new beauty on this tour, and today is no exception. We will ride the shores of two beautiful lakes, Calafquén and Panguipulli, and will cycle three-quarters of the way around Villarrica, a majestic, snow-capped active volcano. 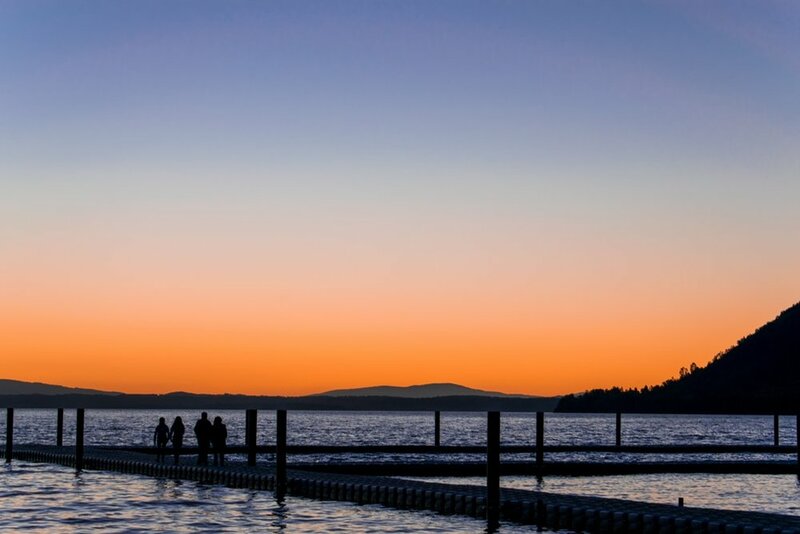 We’ll ride through the lake-side town of Licanray on roads bordered by green prairies and native forests. The first 21-mile section passes through green meadows with native forests and the Calafquén Lake on your left, by a road without many long ascends. This road is smooth and quiet as almost no vehicles drive here. At one point we should be able to see five volcanoes. After a fun descent toward the town and Lake of Panguipulli – meaning “land of lions” – we have the picnic lunch by the beach at Lake Panguipulli. From here we can contiue riding another 15 miles alongside Lake Panguipulli until the end of the paved road near Choshuenco. and stay overnight at the incredible Nothofagus Hotel. After breakfast and saying goodbye to Huilo Huilo reserve, we’ll drive 2 hrs to the town of Futrono, where we’ll get the bikes off the trailer and start our beautiful ride round the shores of Lake Ranco. This road has been paved just few months ago and we’ll be able to admire on its splendor passing by small towns as Llifen and Lago Ranco, see views of the Huapi Island and many green land that is used for agriculture and cattle rising. After enjoying lunch we’ll face the most challenging part of the route, making push yourself on some great short climbs. After 70 kms we’ll end the ride and drive to the town of Osorno, where we’ll do check in at your hotel and enjoy dinner. After breakfast, we’ll ride 3 hours to Osorno city. We will ride through rolling hills and beautiful beaches along Lake Llanquihue, always on the lookout for wildlife and views of 4 volcanoes (Osorno, Puntiagudo, Casablanca and Puyehue). With the lake on one side, green pastures and fields on the other, and the snow-capped Andes in the distance, this will be another picturesque day on our bicycles. The cycling today consists of small hills and long, flat stretches most of the day. Upon arrival to Llanquihue, we’ll drive 20 minutes to Puerto Varas and stay overnight at hotel in Puerto Varas. In the morning, the vans will take us to the shores of beautiful Lake Llanquihue where we will approach the Osorno Volcano with its perfect cone. As we cycle along the lake, the snow-capped volcano appears to rise directly out of the lake, and we will have wonderful views of it during much of the day. 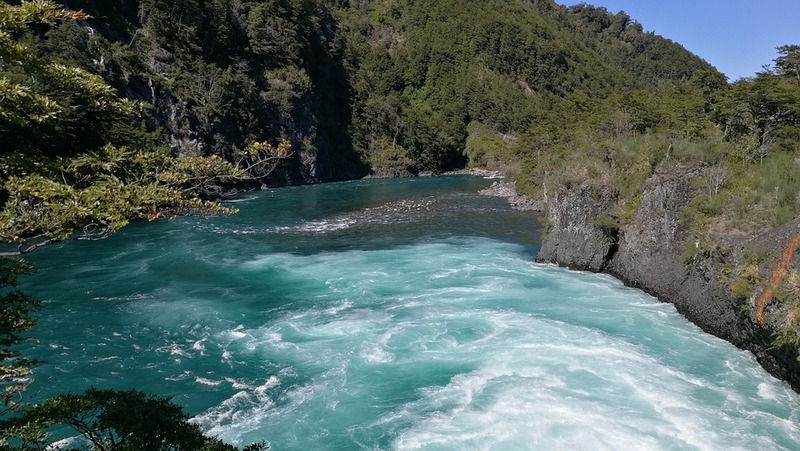 We’ll pass through the village of Ensenada, then on to the Vicente Perez Rosales National Park and hike a short distance to the dramatic Petrohue Falls. After a 40 minutes ride in the vans, we’ll arrive back to your hotel and have free time to enjoy dinner at the Hotel or walking distance from town. This trip of a lifetime is about to end. 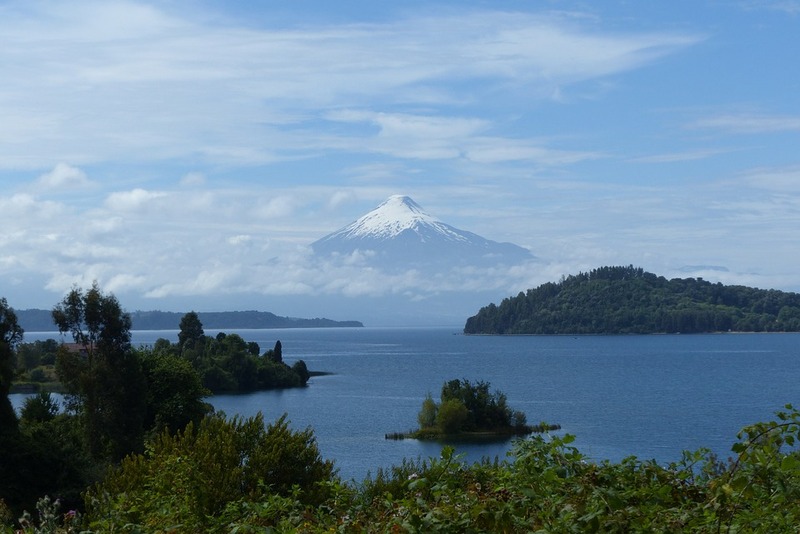 In the morning, we drive out of Puerto Varas and start riding from the Puerto Octay, alongside Lake Llanquihue, where a unique landscape is waiting for us – the Osorno Volcano with its perfect cone. The side of the Volcano reaches the shore of the lake and we’ll pass through the middle of this astounding landscape as we travel to the villages of Las Cascadas and Ensenada. This 67 km northeast section of the Llanquihue Lake Route is one of the most beautiful routes of the tour, as you get closer to Osorno Volcano. steepest climbs in South America if not Europe, with ramps of 22%-24%. Time cycling: 4-6 hours approx. Sadly, it’s time to say good-bye to the beautiful Lake &amp; Volcano District of Chile. After breakfast, we’ll ride in vans to Puerto Montt Airport to catch your flight back to Santiago. It’s been a trip you will always remember!